Charity Wright has a history of picking the wrong guys and has decided to swear off men for the month of December–no dates, no kisses, no holiday romance–a decision made all that much harder when she meets the man that could be her Mr. Right, Marietta native and professional baseball player, Quinn Douglas. Just out of a long term relationship, Quinn Douglas isn’t looking for love at the Little Teton Resort, and he certainly isn’t interested in a girl from home, but now that he’s met Charity, he can’t get her out of his mind. Charity even has him rethinking his career and life on the road. Is Charity the missing piece he’s been looking for? It wasn’t the worst breakup in history. Charity Wright knew that on the spectrum of heartbreaks, hers was mild. It was the sort of thing that someone might say “I have a touch of the flu,” except hers was a touch of heartbreak. Not so devastating that the holidays would be completely ruined but dispiriting, for sure. She secretly suspected that she might be getting too old to believe that happy-ever-afters could exist. And yet, she wasn’t a good pessimist. She preferred to see the glass as half-full, but on the inside she was increasingly worried. Was something wrong with her? Why couldn’t she meet “the one”? Or, had she met the one—her thoughts immediately went to her first love, Joe Wyatt, before shying away—and she’d blown her only opportunity for happy-ever-after? Maybe soul mates didn’t exist. Maybe there wouldn’t be a Mr. Right for her, never mind a Mr. Perfect. Her younger sister, Amanda, said Charity hadn’t found Mr. Right because Charity’s standards weren’t high enough—at least not since Joe, and he was years ago. Older-sister Jenny said it was because all those romance novels Charity had read growing up had poisoned her brain, making her think that love was easy and fun. Obviously Jenny had never read a romance novel, because in romance, love was not easy or fun. Love was a battlefield, with a little nod to the great 80s’ singer, Pat Benatar. This was why Charity needed a break from men and dating. She was just too banged up. A little too bruised. Charity was usually a never-ending well of hope, but at the moment, her hope was running dry. Which was why she kept thinking about Tricia’s offer to attend the travel agent familiarization trip in Wyoming in Tricia’s place. It’d be a chance to get away from Marietta, a chance to have a break from the real estate office—as she unfortunately worked with her ex, the double-timing Greg—and a chance to go somewhere she’d never been. The Tetons were only a five-hour drive from Marietta, but she’d never been. Growing up, the Wright sisters hadn’t traveled much because the family didn’t have the means to travel, never mind manage rent and food. But Charity was thirty now, and this travel agent familiarization would get her there, and even better, it was free. A four-night, five-day all-expense paid trip to a little ski resort in Wyoming. Would it be so wrong to go? Was it so awful to pretend to be Tricia Thorpe instead of Charity Wright? It wasn’t as if Tricia was a stranger. Tricia had been a close friend since they were girls, and Tricia’s brother married Charity’s sister, Jenny, making them family. And since Tricia couldn’t go on the trip due to a work conflict, and the Little Teton ski resort really wanted Marietta Travel to participate, why couldn’t Charity represent Marietta Travel? It wasn’t as if Charity knew nothing about the travel agency. She’d worked for them one summer when they were shorthanded and she was in between jobs. True, she hadn’t actually booked travel, but she’d filed brochures and printed travel itineraries and assisted the agents with their research. She actually quite liked the job. She’d hoped they would hire her and train her, but they had wanted someone with experience, someone who already knew how to use the computer software and had a client base. That’s how Charity had ended up working for Sam Melk at Melk Realty, and then how she met Greg, who’d been hired a year after she started there. They were no longer dating, but Greg remained a problem, making little digs, constantly goading her. Charity shouldn’t have ever dated him in the first place, but what was done was done. All she could do was move forward. A trip to Wyoming sounded like the perfect break, a most welcome break. Provided she didn’t have to ski—of course she’d been skiing at Bridger Bowl, just outside of Bozeman and she’d also done a little bit of skiing at Big Sky—but she was still quite an intermediate skier, and wasn’t cut out for black diamond anything. Tricia had said no skiing was required. Tricia said Charity simply needed to soak up all the information and report back, and if there was anything Charity did well, it was taking notes. Charity shut down her computer, walked through Melk Realty turning off printers and lights, adjusting the thermostat for the night, before locking the door on the office and making her way two blocks south on Main Street to Marietta Travel. Outside, festive white lights framed the windows and green garland wrapped around the light posts lining the street. The decorations on Main Street were familiar and beloved, and while Charity cherished her life in Marietta, there were disadvantages to living in a small town. She knew everyone, and everyone knew her, which also meant they knew when her romantic life derailed. Marietta Travel still blazed with light and, peeking through the front window painted with a huge blue globe, topped with a jaunty red ribbon and the words The World is Yours in a gorgeous font, Charity spotted Tricia still at her desk in the glassed-in office at the very back. Charity gave the painted window a quick critical study before trying the door. The paint was holding up. Good. She’d worried it might crack with the cold but it looked perfect still. No one but Tricia knew Charity had painted the window when Tricia’s usual sign painter tripped on his own icy sidewalk and broke his wrist, preventing him from doing the job. Tricia knew that Charity was forever sketching clothes, and asked Charity if she’d be willing to decorate their window for the Marietta Stroll, and Charity hadn’t been able to turn down the chance to make a little extra money on the side. With both of her parents now retired, money in her family was always tight. By the time they’d arrived on December twenty-third, the Sterling ranch house had already been prepped by staff for the holidays, with a fourteen-foot tree in the great room, and fresh green boughs wrapping the rough-hewn bannister railings. Gingerbread cookies had been baked and fires had crackled in all seven fireplaces. There had been a lot of eating and drinking and extravagant gift giving. 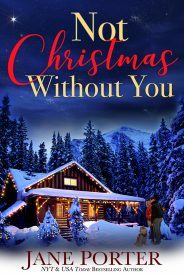 Quinn had found Christmas with the Sterlings perfectly enjoyable—after all, it was his second holiday spent with them—but a Sterling Christmas was a far cry to his humble beginnings in Paradise Valley, Montana. Last year, on Christmas Day, he drove to Marietta for an evening meal with his family—sister McKenna and her clan, brother Rory and his new bride. McKenna hosted a Douglas family dinner at her and Trey’s house, and it was the complete opposite of the Sterling Christmas—noisy and chaotic with babies crying and kids fighting and lots of good-natured ribbing and laughter. There was no staff to do the work, thus everyone pitched in, with cooking and kids and cleanup. Quinn enjoyed playing bachelor uncle, even on his back in front of the living room fire with his nieces and nephews crawling all over him. He’d loved being with his family, and he adored the nieces and nephews, but it made him question the future. His future. His phone rang as he waited for his rental car to be brought around. He glanced at the number. Alice. Quinn tensed and then took a deep breath and answered the call. Even though they’d broken up over the summer, she still stayed in close touch, in hopes that they might get back together. “Hey,” he said, answering, the call. “So you made it?” she asked. “It is gorgeous,” he agreed, suppressing the ambivalence he felt every time they talked. Alice had wanted to marry him. She still wanted to marry him. They’d dated for almost three years, and she’d taken the breakup hard, feeling as if she’d invested a huge chunk of her life into him and she was still trying to get him back. There would be no going back. He didn’t know how to explain it to her without hurting her more, and so he smashed his unease and tried to be supportive, hoping that eventually she’d meet someone new and be able to move on. “Lots of snow?” she asked. “Mmm.” Quinn wasn’t about to contradict her, because Alice had always been a daddy’s girl, but Leo Sterling was ruthless, and he’d made a fortune by taking advantage of those who were desperate. It wasn’t the way Quinn had been raised and it made him leery of the future. If he married Alice, he could walk out of professional sports and be set for life, not because of what he’d achieved, but because her father, Leo Sterling, had built a dazzling real estate empire of luxury properties across the world and was one of the wealthiest men on the West Coast. Quinn could leave baseball behind—and Alice was desperate for him to leave ball and get off the road—and then Quinn could become her father’s right hand, the son he never had. It was all that Alice wanted. He tried to share with Alice his reservations, but she couldn’t understand why he wouldn’t want to be part of her family’s company. His resistance to working with her family became an issue between them, and it made him question his commitment to her. If he truly loved Alice, the shifting of his career shouldn’t be so hard. If he loved Alice, he should be happy to stay in Seattle and become vice president of Sterling Luxury Resorts. It would be a cushy job. All the hard work would have been done for him. All he needed to do was show up, dress the part, wine and dine clients, shake hands, sign a few autographs and be the good son-in-law, Seattle Mariner third baseman, Quinn Douglas, baseball hero. There was nothing about the job description that appealed, though. “The car is here,” he said, noting the black four-wheel-drive truck pulling up. Quinn hung up before she could reply and ground his teeth together. This was the part he couldn’t stomach. Alice might be beautiful and smart and well connected, but she didn’t understand that he came from a very different family, with different values. And maybe his parents had died when he was a teenager, but he was old enough to have internalized those values. People mattered. Kindness mattered. Integrity mattered. Alice had a good side, and he admired her immensely for being ambitious and hardworking, but he wasn’t ever going to be able to peel her away from Seattle, and he had family in Montana and it was his dream to one day return to Montana full time. When he broached the subject to Alice in early July, she recoiled, rejecting the idea of ever living in Montana permanently, and he suddenly had clarity on their relationship. He could love someone, but it didn’t make the relationship right. He could want the best for someone, but it didn’t mean that person was his person. And so instead of proposing, during the July All-Star Break, he broke up with her. It had been five months since he ended the relationship but she was still hanging on, determined to get him back. He had no plans to get back together with her. Ever. She was a great woman. She just wasn’t his woman. Charity had been worried that forecast of snow would make the drive over the Teton Pass treacherous, but her seven-year-old Subaru handled the roads beautifully, and yes, the snow fell steadily, but there was no wind and her windshield wipers did a great job of scraping the window clean, keeping her view clear. She’d armed herself with a thermos of coffee and mentally prepared herself for a long drive, but even with a stop for gas, she’d made it in less than four and a half hours, delighted to arrive at the privately owned Little Teton Resort before dark. Parking her car out front in the area marked for reception, Charity headed into the lodge to check-in. The split-log lodge, built in the late 1960s, was more practical than luxurious, but the soaring ceiling featured sturdy beams, a fragrant Christmas tree in the corner, dark green garland swags over the various doorways, and an enormous wreath with a jaunty red bow over the stacked stone fireplace. The building’s design was more utilitarian than some of the fancier lodges over the mountain in Jackson Hole, but the decorations were cheerful and inviting. Check-in at the front desk was easy. She gave them Trisha’s name and ID Trish had given her, and the friendly reception clerk handed over a key, a map of the property, and a welcome packet for the Little Teton fam. “There’s a welcome reception tonight for all the travel agents. The reception will be in this building upstairs in the Fireside Room.” The clerk opened the map and drew some Xs here and there, showing Charity where the Fireside Room was, and then where to park, and how to find her room as Charity wouldn’t be in the main lodge, but in Aspen Lodge, one of the adjacent buildings. Charity headed back outside to move her car. It was dark now and lights were coming on, reflecting brightly off the freshly fallen snow. She drew a deep breath, inhaling the crisp cold air, excited to be at the Little Teton for the next five days. It had been a long time since she’d done something just for fun. Using her map, Charity found her way to the lot behind the two-story Aspen Lodge and parked in one of the many open spaces. As she turned her engine off, she frowned as she surveyed the virtually empty parking lot. It was too quiet. Indeed, when she’d turned down the small Main Street she thought the entire ski town looked quiet. Low numbers had been a problem for the resort and that was why the Pace family had poured money into Little Teton, trying to refresh the resort and ski runs, but the word didn’t seem to have gotten out yet. Charity swung her backpack filled with books onto her shoulders and then lugged her big suitcase out of the trunk of her old Subaru, glad no one could see her mammoth suitcase. Winter clothes and snow boots took up a lot of room and then she also wanted to bring some cute clothes for the indoor activities. Just because she was single, didn’t mean she couldn’t still feel pretty. One of the wheels on the suitcase no longer rolled, so she half carried, half dragged the case through the snow toward the lodge entrance. Yellow lamps made everything glow and she drew a deep breath, surprisingly excited to be here. She’d never been to Jackson Hole, or any of the resorts on this side of the Grand Tetons. It wouldn’t be hard to appear enthusiastic for the fam trip because she really did want to learn about the resort and runs. Charity was determined to take great notes back so Tricia could sell Little Teton to her customers and everyone would be happy. The backpack straps slid down her shoulders to her arms as she wrested the suitcase over a patch of ice. “Thank you,” she answered breathlessly, pushing the straps of the backpack up and then a tendril of hair out of her eyes to get a better look at him because first impression was, well, impressive. Second impression was just as positive. He was tall and fit and ruggedly good-looking with shaggy, dark blond hair, scruff on his square jaw, and high hard cheekbones. “That’s a big suitcase,” he said, opening the front door and holding it for her, before following with the bag. “A girl has to have options,” she answered with a smile, glancing around the interior. The lobby of Aspen was small, but cozy, with two sets of hunter-green leather chairs, a fire crackling in the stacked stone hearth, and a collection of pine trees in the corner covered in tiny white lights. Huge glass jars filled with candy canes and peppermints decorated the mantel while a white wooden reindeer with a green wreath around its neck filled the low coffee table. So this was the sportswriter. The desk clerk had called him gorgeous, and he was. “Tricia Thorpe,” she said shyly, extending her hand. “Douglas Quincy,” he replied, his big hand engulfing hers, fingers closing around hers. His palm was so warm, and the touch of his skin sent a little jolt of electricity shooting up her arm. Charity quickly retracted her hand, and rubbed it on the back of her coat, trying to erase the tingling sensation. She’d have to be careful around Douglas. He was exactly what she didn’t need, not at this point in her chaotic, confusing life. “Where’s home for you?” she asked. Quinn watched Tricia disappear down the hallway with her massive suitcase and knapsack, her long blonde ponytail swinging. She was pretty, really pretty, with a wide, uncertain smile and blue eyes that held more than a hint of wariness in them. Her suitcase looked as if he it hadn’t been used in a long time, and her knapsack belonged to a day hiker rather than a world traveler. Quinn suspected she didn’t get out and travel as much as her customers. If that was true, he was glad she was here. He didn’t know why, but she struck him as someone in need of a break, and maybe some fun. Quinn hadn’t come for fun. When Peter Pace had reached out to Quinn about potentially investing in Little Teton, Quinn’s immediate thought had been no. He didn’t ski due to a clause in his contract, but it hadn’t been a huge loss as he’d liked to ski as a boy, but it had never been a passion. Baseball had always been his thing, and he’d been lucky to turn it into a lucrative career. But after thinking about Peter’s request a bit more, Quinn at least owed Peter the opportunity to show him what he’d done in Wyoming, which was why Quinn was here now, under the name Douglas Quincy. He wanted to see if there was a way he could help, but he wouldn’t know the answer to that until he’d been here for the week. That evening, Charity spotted Douglas the moment she entered the meeting room off the main lodge’s lobby. He was the tallest person in the room, and incredibly easy on the eyes. He was also circled by a large group of women who seemed to find him utterly charming. Charity smiled to herself and went to the beverage table to grab a bottle of water but then spotted the red and white wine and decided, a glass of red would be really lovely about now. She wasn’t exactly nervous being here, but she was out of her element. As she sipped her wine, she glanced around the room. From the way it’d been set up, she gathered that there would be a presentation. Two rows of chairs faced a podium and screen at one end of the room, while tables of food and drink were at this end. She snagged some of the skewered meat sticks and cheese cubes before heading toward the chairs. If Tricia was here, she’d mingle with the other agents, but Charity didn’t have Tricia’s confidence. But then, Tricia did these familiarizations all the time as hotels and airlines used the free trips as a way to show off new airplane routes or properties, and Marietta Travel might be small, but Paradise Valley was filled with wealthy people who could afford to go where they wanted, whenever they wanted. A shadow stretched over her. She glanced up to discover the sportswriter at her side, smiling. His smile was a thing of perfection—straight white teeth, great jaw, lovely mouth. “It’s certainly a cute place,” she answered. She shook her head and sipped her wine. “Are you a fondue fan?” she asked innocently. She was rewarded with a laugh, and the deep, husky appreciative sound burrowed inside of Charity, warming her. He really was incredibly attractive, and it wasn’t just his looks—which were exceptional—but it was his smile and laugh and the way he just seemed so much larger than life. More real, more alive somehow. “It’ll be interesting to see how family friendly they are,” he added. She nodded as a pair of women squeezed past them to sit down in their row. Others were taking chairs in the row ahead of them. “Have you gone on a lot of fam trips?” he asked. He waited a moment, eyes narrowed as his gaze swept her face before lingering on her rueful smile. “What’s the most recent bad decision?” he asked. Conversation was curtailed by the appearance of a man at the podium. For the next ten minutes they watched a video about the history of skiing in Wyoming and the creation of the Little Teton Resort in the Grand Teton Mountains. The short film used old photographs and some home movie clips to convey the history of the resort, before seguing into the new owners’ vision for Little Teton, and the developments they’d done since acquiring the resort two years ago. By the time the film was over, Charity wished she was a real travel agent who could send the resort dozens of guests. They stepped out of their row so everyone else could escape. Resort staff were stacking the platters and collecting dirty dishes from a tray in the corner. “What are your plans for the rest of the evening?” Douglas asked, as she added her empty wineglass to one of the big trays. “Romance,” she said a little defiantly, waiting for him to make fun of her. “Yes, really. I love that they always end happy. I love that in a romance the woman is just as important as the hero. In fact, I think she is the hero.” Charity lifted her chin, expression challenging, again waiting for him to make a smart remark, but he just gave her another smile, creases fanning from his eyes. Did you know that Not Christmas Without You and many titles are available digitally from Tule's own bookstore? Check it out!